Time lapses are fun to watch, but even more fun to make. If you are still learning how exposure, aperture, shutter speed, ISO, and all those DSLR-esque terms play into making a great image, try experimenting with making a time lapse. You will gain a wealth of knowledge! A month ago, we got a cheap digital timer remote from Amazon for about $29. Compared to the Canon brand ($137), this seems like a steal. Time will tell how long it lasts, but for now it works like a champ. 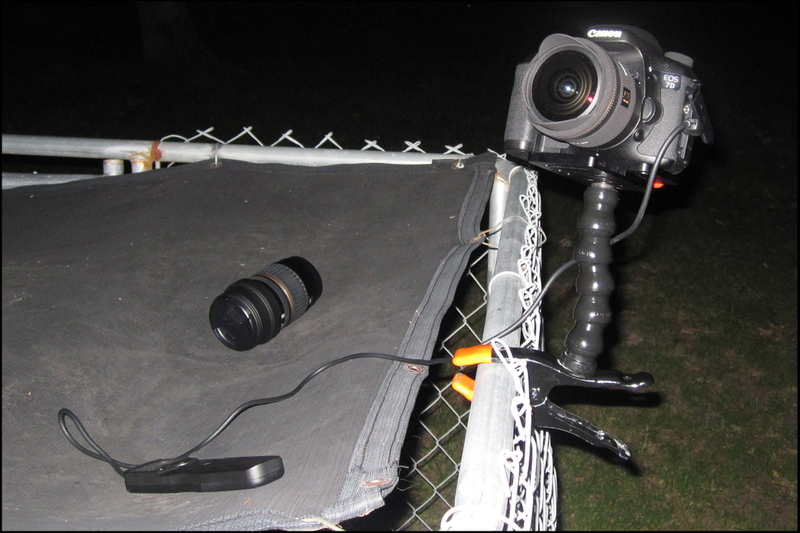 For my first lesson, I realized I had forgotten to grab a tripod, but I did have the nifty nasty clamp on hand. See pic below. The video below was a first test. Timelapse Test #1 from Unblind Productions on Vimeo. A second lesson was that the ISO was set on auto, should have left it on about 3200. After 2 hours of shooting, the images were opened in Quicktime Player 7. Here is the work flow. 2) Then another window will open, then go to the folder that has all images from the shoot. Click on the first image in the folder, and it will load all the following images into QT7 as a movie. 3) A window will pop up asking you what frame rate, set it to your liking. 5) From there export the movie as an H.264, or if you would like to color grade it, export as a ProRes file, and drop in FCP or Premiere. The movie above was set at 24fps. So for about 2 hour of taking photos only a 9 second movie was captured. So much time for such little work. But just watching the video you can see how the night sky comes alive, and it is amazing to see the earth rotating. Hopefully with more practice I can get the exposure right. One last note, you don’t have to have an expensive camera to make a time lapse movie. You can use many inexpensive cameras to do this. Some cameras even come with a time lapse feature in them. But if you are wanting quality, and a sharper, less grainy movie…. then putting a little more cash towards a better camera, and faster lens is your best bet. But why buy a nice camera for just time lapse? Go make a movie while your at it! More experimenting coming soon! What if you have quicktime 10? what is the workflow for that? I would purchase Quicktime Pro. Quicktime 10 is basically for watching…not many editing type of features. You should have Quicktime 7. It is either in your Utilities folder, or you might need to get your software install disc that came with you Mac, and load it from there. When you do load it, it will probably put it in your Utilities folder.